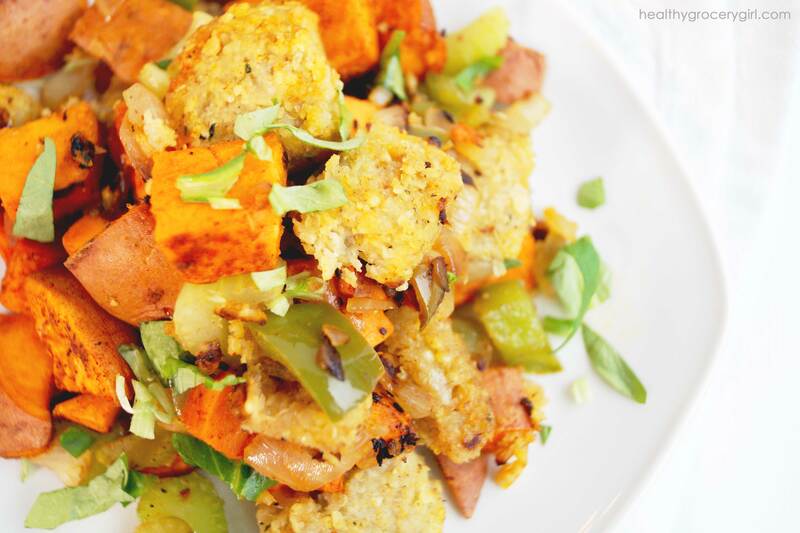 This dish is full of flavor and feels like comfort food, without any of the guilt! Garnish with fresh herbs of choice (or thinly sliced spinach) and enjoy! Love garlic? Go for 3 cloves instead of one! Today there are many options for veggie burgers and most are full of processed ingredients, genetically modified soy-protein and other ingredients we can’t even pronounce! 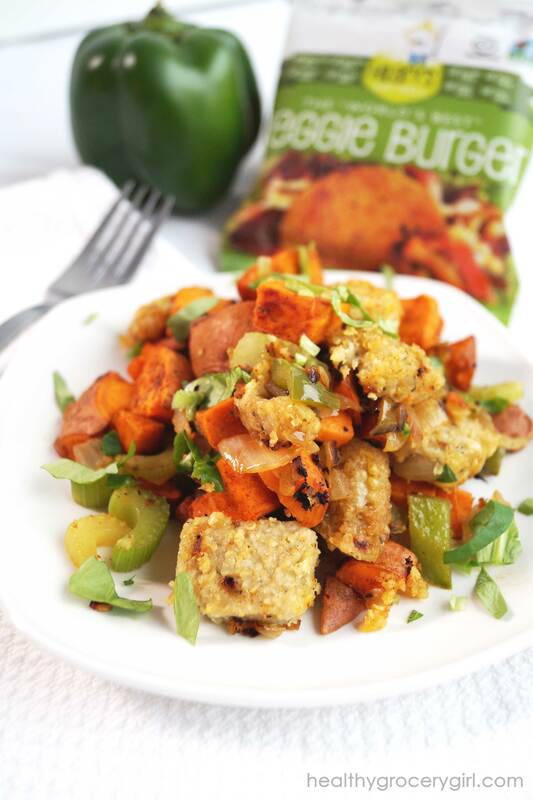 However, veggie burgers are such a versatile staple for plant-based eaters like myself, and you know I love when healthy meets convenience! 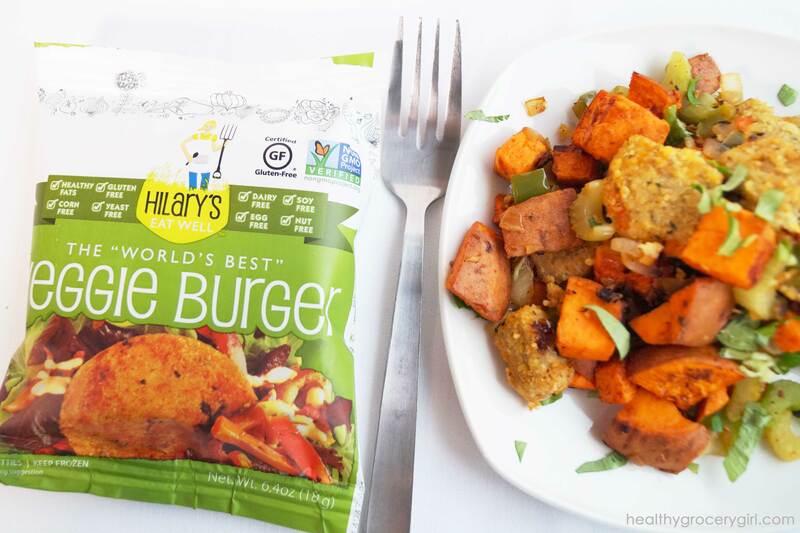 That is why I love Hilary’s Eat Well burgers, they are one of the few veggie patties that I would actually recommend to you, because their ingredient list is amazing. Hilary’s burgers come in a variety of delicious flavors from Adzuki Bean Burgers to Hemp & Green Burgers! They are found in the frozen section of the grocery store next to all of the other frozen veggie burgers. If you give them a try, I’d love to know what you think! You can always leave a comment below this blog post to join in on or start a conversation. Disclaimer: Today’s blog post and video is sponsored by Hilary’s Eat Well. The recipe, content creation and opinions are my own. I have been a fan of Hilary’s Eat Well products for years and so I am very honored to be working them! Running Healthy Grocery Girl LLC is my full time job and sponsorship helps HealthyGroceryGirl.com continue to provide free recipe blogs and videos to our readers and subscribers. I would want you to know about Hilary’s whether I was working with them or not!